It has been raining all day, with temperatures in the 40s, so nobody in this house is inclined to go outside. The ground is covered with leaves knocked down from the latest rain showers. It’s also covered with robins. At lunchtime, for example, I looked out the window and saw eight of them in the front yard. They’re probably looking for worms, because worms come out of the ground when it rains to avoid drowning. In that sense, today is when the robins have their Thanksgiving feast. As the Thanksgiving weekend and the month of November draw to a close, I have several links to interesting news stories I have read over the past day or two. The first two have to do with the Second World War, hence the title to this message. And in London, the tunnels under the center of the city, used as wartime shelters and for several secret government functions, are now on sale for $7.4 million. I sure hope they check the background of whoever buys the tunnel network; we don’t want terrorists or any criminal syndicate turning them into a hideaway. Now we have proof that Herodotus was telling the truth when he told us that the Scythians were the first people to smoke marijuana. The tomb of a Central Asian shaman was found in northwest China, and dated to 700 B.C. (near the beginning of the Scythian era on the steppes). He had blond hair and blue eyes, so he could not have been Chinese, and he was buried with his supply of pot, 789 grams (1.73 pounds) of the stuff. And a few months ago, it was announced that several large communities, which could have been home to as many as 50,000 people, existed in the middle of the Amazon basin before Europeans arrived in the western hemisphere. Normally a jungle is a nasty place to live, with all kinds of microbes and beasties waiting to kill you, and the soil is usually too poor to farm on it for long, so how did the Indians build these pre-Columbian towns? Now a National Geographic article suggests an answer; contrary to what is found elsewhere, some of the world’s most fertile soil was right here! And remember the controversy over the Pledge of Allegiance from a few years back, where some atheists tried to ban it because it contained the words “under God?” Now the pastor who made sure the words “under God” were in it has died at the age of 97. And finally, along the line of the last link, here’s the video where Red Skelton explains what the Pledge of Allegiance means. If you’re like me, when you hear the name “Red Skelton,” you probably think of comedy from the early days of television (the 1950s and 60s), but here he was serious, and did a better job of explaining the Pledge than anyone else I know. Every year during the Christmas holiday shopping rush, I expect to hear a news story about one shopper killing another over the newest hot toy. Well, thanks to the recession, it doesn’t look like this year will have anything like Cabbage Patch Kids, Furby or Tickle Me Elmo in big demand, but this year it happened anyway. Yesterday, during the “Black Friday” rush at a Wal-Mart on Long Island, NY, 2,000 impatient shoppers trampled a temporary worker to death, as he tried to open the doors. Then, over at a Toys R Us store in Palm Desert, CA, two men shot and killed each other when the women they were with got into a fight. Nice going, folks. Last year I wrote an essay defending Christmas from atheists and liberals in general, and now this year’s shoppers tell me that they have forgotten what Christmas is all about. If I had known you were going to do this, I might not have bothered to write. For that matter, I don’t think the true meaning of any holiday is widely known anymore. For most folks, it seems that a holiday on the calendar is just an excuse to take a day off from work, and spend money in some shopping specials. That seemed to be the attitude in my workplace, when most of my co-workers voted to move Columbus Day to the day after Thanksgiving, and Veterans Day to the day after Christmas, so they wouldn’t have to come back for the last Friday of both November and December. To me it seemed unnatural to move holidays that much. Not only am I unlikely to think of Columbus after I’ve been thinking of Pilgrims and Indians (For crying out loud, there’s more than a century between 1492 and 1621! ), but the schedule leaves us with no days off between Labor Day and Thanksgiving, a span of almost three months. Right after the election results came in, we heard on the news that Barack Obama was going to celebrate by getting a puppy for his daughters. I haven’t heard much since, so I figured they don’t have the puppy yet. Then a few days ago my brother sent me this picture, asking if this was the new White House puppy. I remember when the Clintons decided to get a dog, they went by the polls; first they did it because dogs are more popular than cats as pets, then they chose a Labrador retriever (Buddy) because they’re America’s most popular breed of dog. 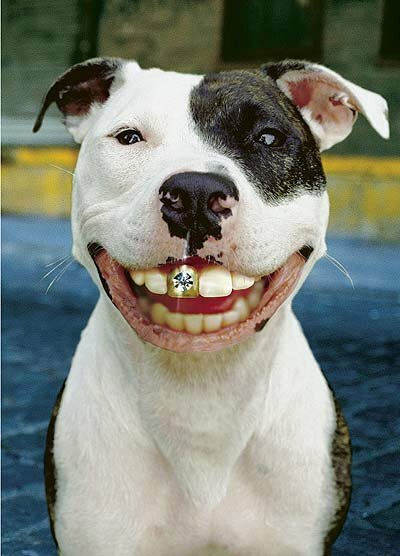 Well, if this is the mutt, it looks to me like the Obamas didn’t check the polls. But he/she does appear to have the requisite bling, anyway. That’s the name I have long used for the unofficial holiday so many folks take off, on the day after Thanksgiving. This year, however, I have heard it called “Black Friday,” because many merchants hope that it will be the day when they get enough shoppers to put their account balances “in the black.” As one who dislikes crowds on principle, that has the opposite effect on me; a heavy shopping day will make sure I stay home, instead of going to the store. Yesterday I went out in the afternoon to get some last-minute ingredients for Leive’s cooking. The local Kroger and Wal-Mart didn’t have them, so I decided to try the Meijer on the south side of town, because I hadn’t checked them out lately. Fortunately they had what I was looking for. Because the other stores weren’t open, that must have been the first time I ever drove on Nicholasville Rd, without having to fight swarms of traffic! When I drove past Best Buy, the store was closed and tape was put in front of the doors, but I still saw five tents pitched nearby. I can see people camping out for concert tickets, but for shopping specials? It seems like madness, especially in this weather. After I got back, I mowed the lawn, because it looked like it would be the last good day of the year to do that job. This morning I went instead to the mechanic I’ve been going to in Athens, to get the bad solenoid replaced that they detected when I went there on November 1. Would you believe they found nothing wrong with it? Their guess is that a carbon deposit set off the sensor light, but later it was dislodged and the solenoid had no more trouble. Whereas I expected to pay around $200 for parts and labor, they didn’t even charge me for looking at my engine; all I lost was a gallon of gas and a couple of hours. Now that’s what I call service! Instead of having the big meal in the middle of the day like we normally do, we waited until evening, so company could come over. In the end the in-laws, Gene & Rezia King, joined us, as well as two friends of the family, Terry & Heather Cherry, making for a more lively Thanksgiving than we had last year, when it was just Leive, Brin-Brin and I. Another friend dropped in, but he couldn’t stay, because his son called with a broken-down car, between Lexington and Nicholasville. Anyway, here are the promised pictures of the goodies we had. First, the traditional Thanksgiving Day fare. 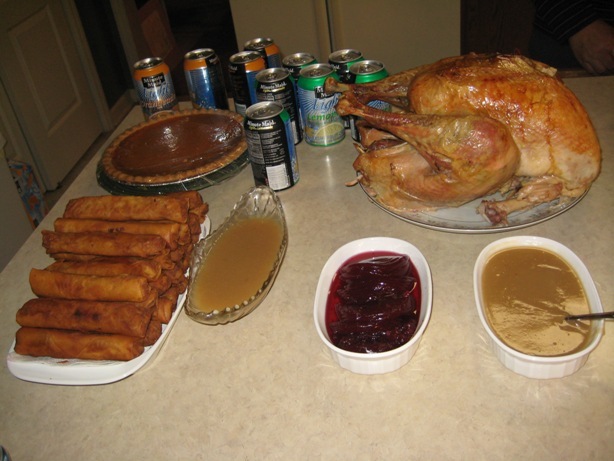 I’m sure you will recognize the turkey, cranberry sauce, two dishes of gravy, and pumpkin pie as such. The cans of Minute Maid soda shouldn’t look too out of place, either. The lumpias (Philippine egg rolls), on the other hand, are a different matter. They were a favorite with everybody, though. Heather with Brin-Brin. Brin-Brin seems to like her and Terry, and he tolerated Rezia this time, but when he saw Gene, he still wanted to attack his toys, or go down to the bottom of the cage and cry! 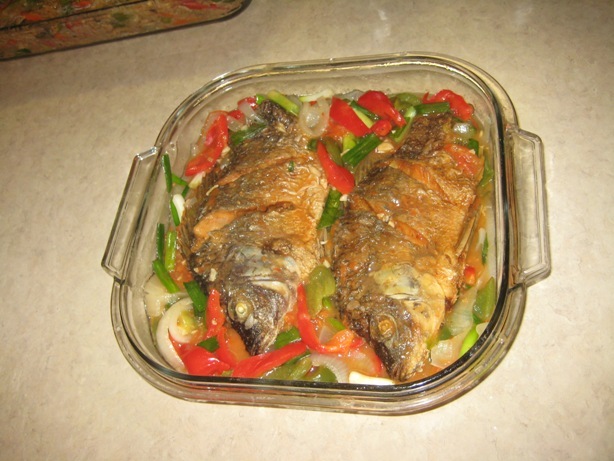 Another Phillipine specialty is escabeche, whole fried fish served with veggies and a sweet & sour sauce. Carp or sea bass is recommended in the cookbook, but Leive got good results with tilapia. 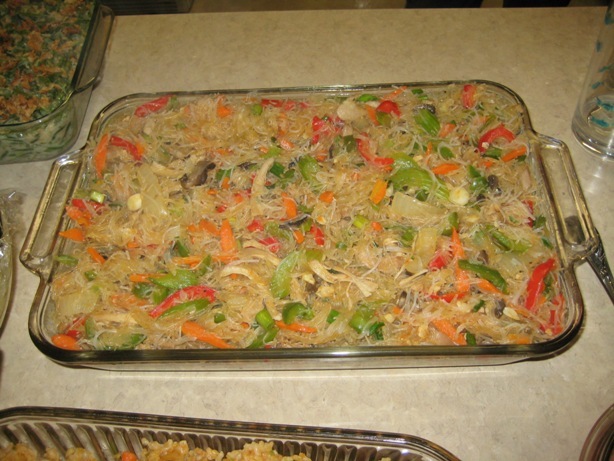 Here is another specialty of Leive’s, pancit sotanghon. Pancit is probably the closest thing to a national dish in the Philippines. Sotanghon noodles are also called “bean threads,” and they look like fishing line until you cook them. 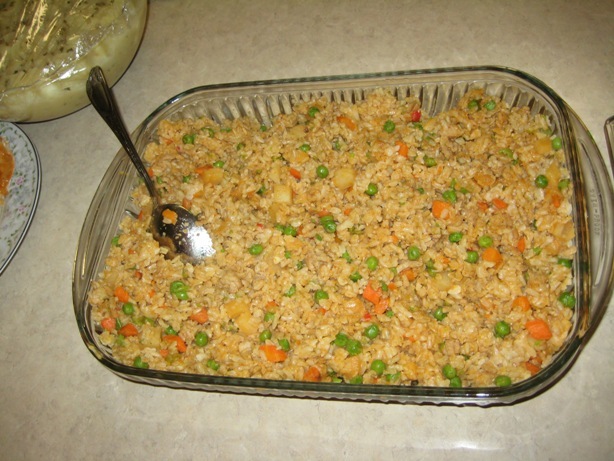 Of course Leive feels no meal is complete without rice. I believe that makes this meal what the Indonesians call a rijstaffel. A green bean and fried onion casserole, with some mashed potatoes. 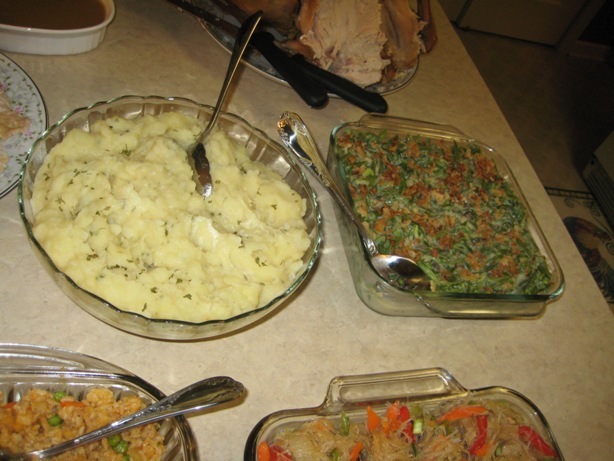 The mashed potatoes were Leive’s special project; she felt she could make them from scratch, with a bag of white potatoes and a can of chicken broth from the store, rather than use the powder-in-a-box we normally see. Everyone thought she succeeded. Remember what I said about Brin-Brin being upset about Gene? Note how his tail is spread out like a fan as Gene walks past; he only does that when he’s excited about something. Hopefully he’ll like Lindy when she arrives in two and a half weeks. Anyway, I hope your holiday was a happy one, too. Okay, Thanksgiving Day is here. Leive hasn’t cooked yet, so the pictures of this year’s spread will have to wait until the next time I write. 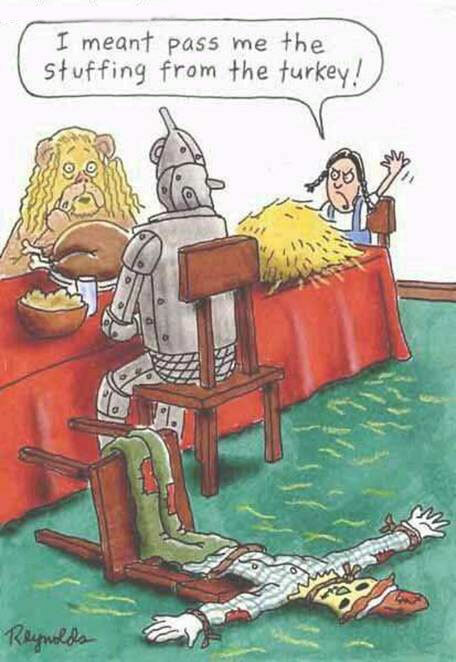 I trust there won’t be any embarrassing mistakes, like what happened when the Wizard of Oz characters tried to have Thanksgiving together (LOL). 1. While the election results weren’t what I wanted, I’m relieved all the campaigning is finally over. This was definitely the longest election of my lifetime. I even posted a couple of comments about it back in early 2007, when this blog was young. Now I can take a break from politics for at least a few months. 2. While the economy is bad, we’ve seen much worse. Thirty years ago, for instance, we had double-digit unemployment rates, double-digit inflation, and double-digit interest rates. Anybody remember the “Misery Index?” You don’t hear much talk about it these days. And I’m thankful to be working for a company that isn’t as affected by the market as most; I have more job security here than I ever did in Florida, I’ll tell you that. So far there haven’t been any layoffs here, and last Tuesday I was informed that we’re going to get our Christmas bonus as well. 3. Paying the bills is still a big challenge, but how often do we have more money than we know what to do with it, anyway? In that sense, nothing has changed from the boom years of 2003-2007. 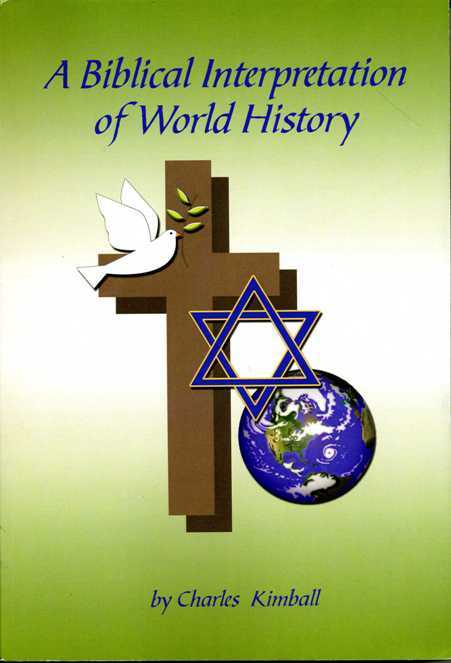 My history book is selling nicely; I’ve been informed that I will have at least thirteen more sales when I next go to Florida, so I’ll have to order some more books for sure before then. Finally, Leive and I are looking at some other ways to increase our income, because we’ll need it to adopt her relatives from the Philippines. So far that is showing promise, too. 4. Bad as the news is, the United States is still one of the best places in the world to live. We still have most of the freedom and prosperity we prize. I’ve only heard a little concerning the economy of other nations, but all that news suggests things are worse elsewhere. 5. Even with tightened belts, our lifestyle is still much better than most of humanity has experienced over the ages. Until two hundred years ago, the life expectancy for most people was forty or less, so by those standards I’m old now. Today’s appliances, transportation, medicine, and education give the ordinary person a more productive, more comfortable lifestyle than even the god-kings of ancient times enjoyed. We can travel anywhere in the world in no more than a day and a half; we can communicate instantly with others almost anywhere; our homes keep a mild indoor climate any month of the year; our supermarkets provide us with food whenever we want it, regardless of the season; our TVs, radios, iPods and stereos provide us with entertainment 24/7, without the need to hire musicians and jesters; our healthcare is far better than what was available to our ancestors. 6. I’m thankful to be reunited with Leive (Thanksgiving of 2006 wasn’t much fun without her). We can look forward to more happy years together. Likewise, I’m glad that Lindy found a good husband, and in three weeks she will finally visit our place. And last but not least, I’m thankful that God is still there and hasn’t deserted us. So enjoy your turkey or ham with the trimmings, and maybe watch today’s football game with the Detroit Lions and plan tomorrow’s shopping trips. But remember who made it all possible for us, and give thanks because of that. I find it appropriate that the United States made Thanksgiving an official holiday in 1863, right in the middle of the Civil War. The country hasn’t seen many years as tough as that one, but still our forefathers were thankful, and we should do likewise. Cheers! We had a hard frost last night. Fortunately my car was in the garage, so I didn’t have to scrape off ice in the morning. We had a quiet day at work, with at least half of the crew on Thanksgiving vacation already. I had to make up the day last week when I left early, so I was the last to leave the office. In previous messages, I told about our parrot’s growing fetish with electronic devices. Recently Brin-Brin got mad when Leive took away the foot pedal for a sewing machine that happened to be near the cage; Brin-Brin must have thought it was another laptop or radio. 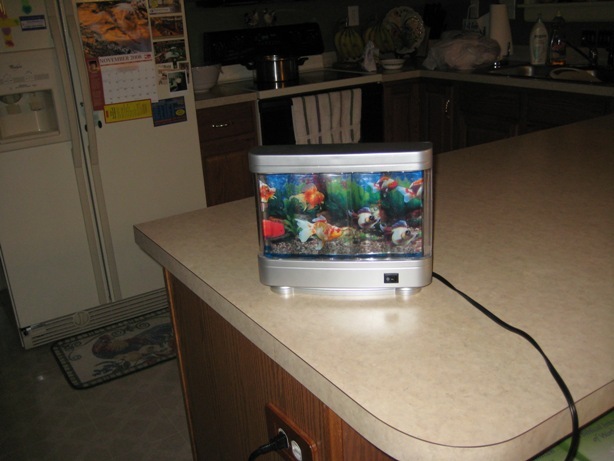 Now Brin-Brin has another gadget to enjoy–a night-light! I have heard that birds are easily startled when it’s dark, and can thrash around when frightened (what’s called a “night fright”), sometimes injuring themselves as well. Brin-Brin had a night fright about a week ago; he wasn’t hurt, but he shook so much that it was scary nonetheless. The best way to minimize that is to give them a night-light, just like you’d do if you had a kid that was afraid of the dark. Last Sunday Leive decided to do that. However, the only night-light we could find in the house was one we brought up from Florida. This one isn’t your typical bulb-in-a-socket that you simply plug into an outlet. It’s an elaborate affair the size of a large book, that looks like an aquarium, with pictures of goldfish swimming by when the light is on. Evidently the scene is some kind of moving conveyor belt. Anyway, for whatever reason, Brin-Brin was attracted to it right away, and will watch it all the time if we let him. He started screaming yesterday when Leive turned the light off and tried to take it away! Here’s a front view of the night-light. I wonder which fish is Brin-Brin’s favorite? And here’s our silly bird watching the show. 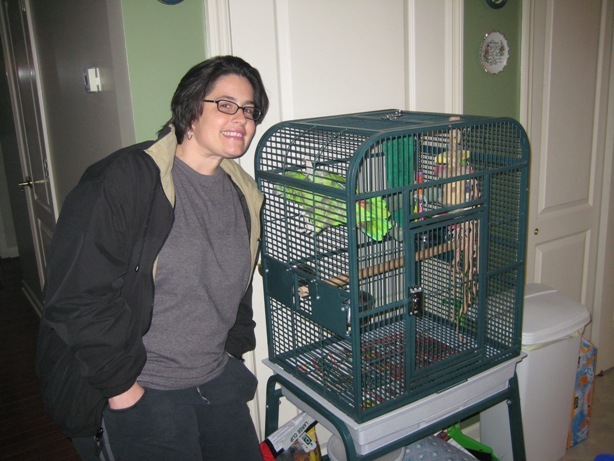 Let the record show that there aren’t many dull moments in the house when you have a parrot. Get up early in the morning and have a cup of coffee. It’s going to be a long day, so place your Parrot on a perch nearby to keep you company while you prepare the meal. Stuff turkey and place it in the roasting pan, and remove Parrot from edge of pan and return him to perch. Have another cup of coffee to steady your nerves. 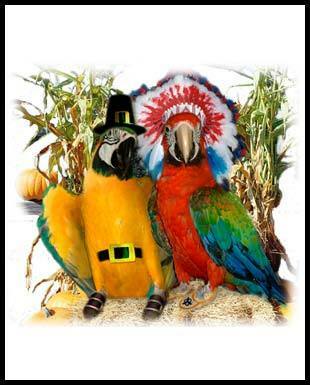 Remove Parrot’s head from turkey cavity and return him to perch, and restuff the turkey. Prepare relish tray, and remember to make twice as much so that you’ll have a regular size serving after the Parrot has eaten his fill. Remove Parrot from kitchen counter and return him to perch. Arrange sweet potatoes in a pan and cover with brown sugar and mini marshmallows. Remove Parrot from edge of pan and return him to perch. Replace missing marshmallows. Brew another pot of coffee. While it is brewing, clean up the torn filter. Pry coffee bean from Parrot’s beak. Have another cup of coffee and remove Parrot from kitchen counter and return him to perch. When time to serve the meal: Place roasted turkey on a large platter, and cover beak marks with strategically placed sprigs of parsley. Put mashed potatoes into serving bowl, rewhip at last minute to conceal beak marks and claw prints. Place pan of sweet potatoes on sideboard, forget presentation as there’s no way to hide the areas of missing marshmallows. Put rolls in decorative basket, remove Parrot from side of basket and return him to perch. Remove beaked rolls, serve what’s left. Set a stick of butter out on the counter to soften – think better and return it to the refrigerator. Wipe down counter to remove mashed potato claw tracks. 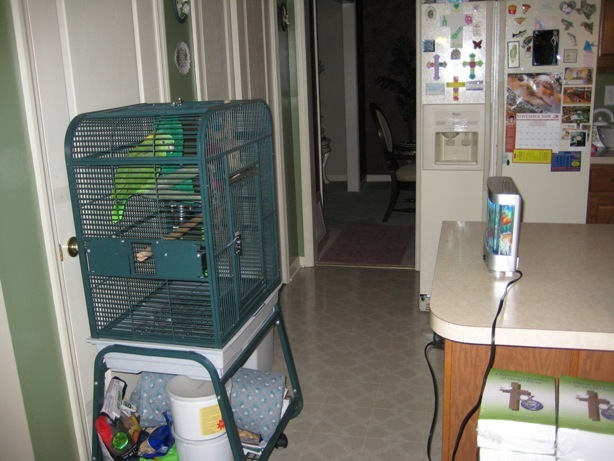 Remove Parrot from kitchen counter and return him to perch. Cut the pie into serving slices. Wipe whipped cream off Parrot’s beak and place large dollops of remaining whipped cream on pie slices. Whole slices are then served to guests, beaked-out portions should be reserved for host & hostess. 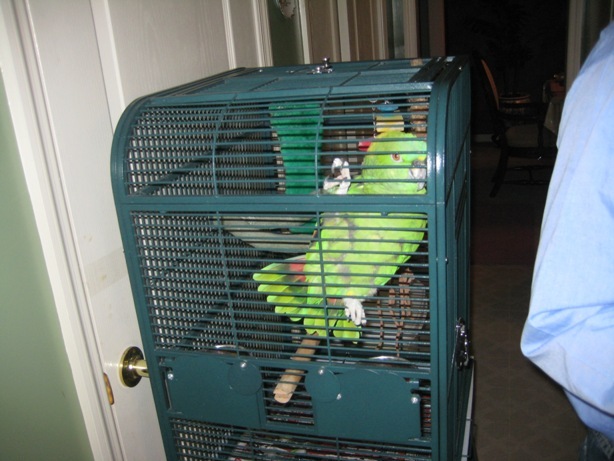 Place Parrot inside cage and lock the door. Sit down to a nice relaxing dinner with your family – accompanied by plaintive cries of “WANT DINNER!” from the other room. And have a happy Thanksgiving!